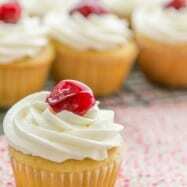 You have to try this vanilla cupcake recipe! 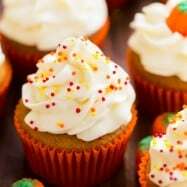 This is the first cupcake recipe I’ve posted. Ever! I’ve posted muffins but not a true cupcake. I guess I’ve been waiting to discover this. My sister Alla introduced me to this recipe. She’s made it several times and each time it was perfect (naturally, if I eat at least 3 cupcakes, I request the recipe). 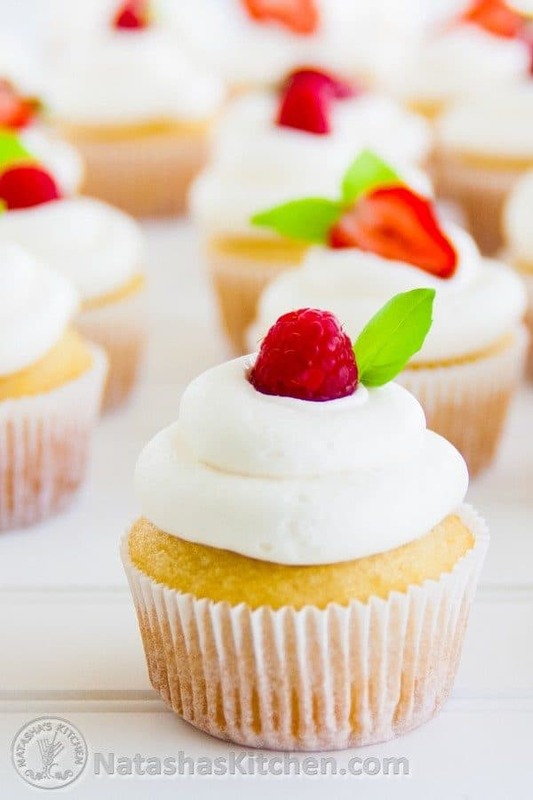 The original dough recipe is from Glorious Treats who tested scores of cupcakes before arriving at this fantastic and truly perfect cupcake recipe. She has also recommended cake flour for best results. I decorated these beauties with raspberries or halved strawberries and basil leaves and the colors were so striking and lovely. They went fast at the baby shower. I suspect people ate more than one because not everyone had a chance to try them (and there were 45 since I tripled the recipe!). I don’t blame you for sneaking multiples ;). P.S. F.Y.I. 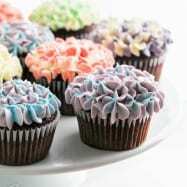 Readers who live in high altitude areas have reported that the cupcakes don’t rise as well in high altitudes. PPS. According to the original recipe author, you can create a 9″ cake out of this recipe. I have not tested this but several readers have reported good results turning it into a cake. You would need to double the recipe for two 9-inch cake layers. Click here for the Best Cupcake Frosting Recipe (as photographed here), or try this new Swiss Meringue Buttercream. 1. 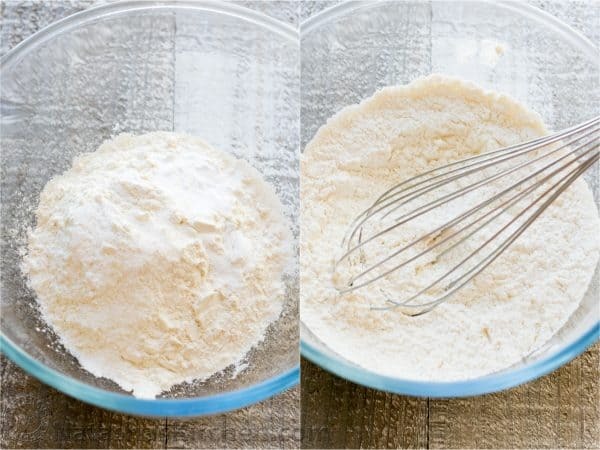 In a medium bowl, whisk together 1 1/4 cups cake flour (or Canadian flour), 1 1/4 tsp baking powder, 1/2 tsp baking soda and 1/2 tsp salt. Set flour mix aside. 2. 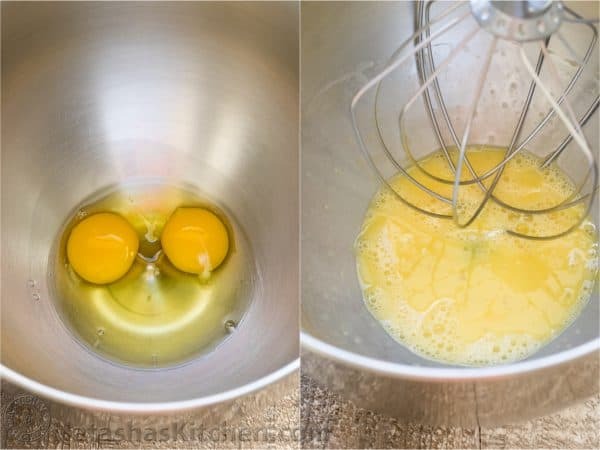 In the bowl of an electric mixer, beat 2 eggs with the whisk attachment on medium speed (15-20 seconds). 3. Add 3/4 cup sugar and continue to beat on medium speed (30 seconds). 5. 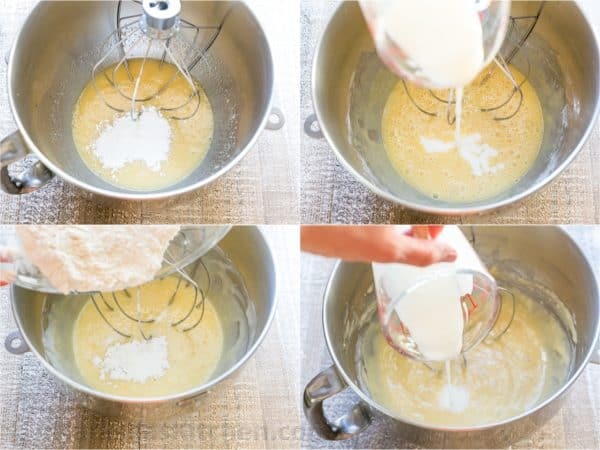 Reduce mixer speed to medium/low and slowly add about half of the flour mixture, mixing until incorporated. Add half of the buttermilk and mix until incorporated. Repeat with remaining flour and buttermilk. Beat until just combined and smooth, scraping down the sides of the mixing bowl as needed. The batter will be thin. 6. 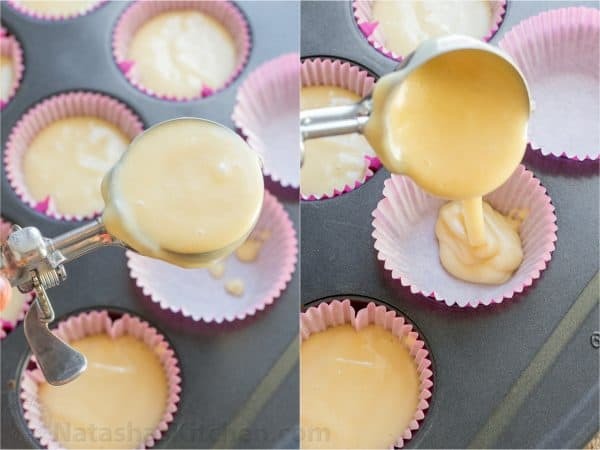 Pour batter into a lined muffin pan. I use a level ice cream scoop for even measuring. Fill liners to about 1/2 full (do not over-fill). 7. Bake for 12 -14 minutes at 350 °F or until a toothpick inserted in the center comes out clean. My oven takes 14 minutes. Let them cool in the pan for a couple minutes, then remove. Note: if baking mini cupcakes, bake 10 minutes. Once the vanilla cupcakes are cooled to room temp, pipe on the frosting. 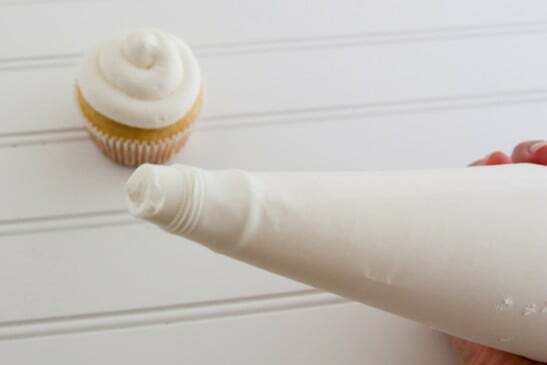 I used this amazing cupcake frosting recipe. When piping on the frosting, I didn’t have the right frosting tip so I just used the coupler and made about circles working from the outside in. It was perfect and super easy! P.S. Use lots of frosting. No one likes a gimpy cupcake. 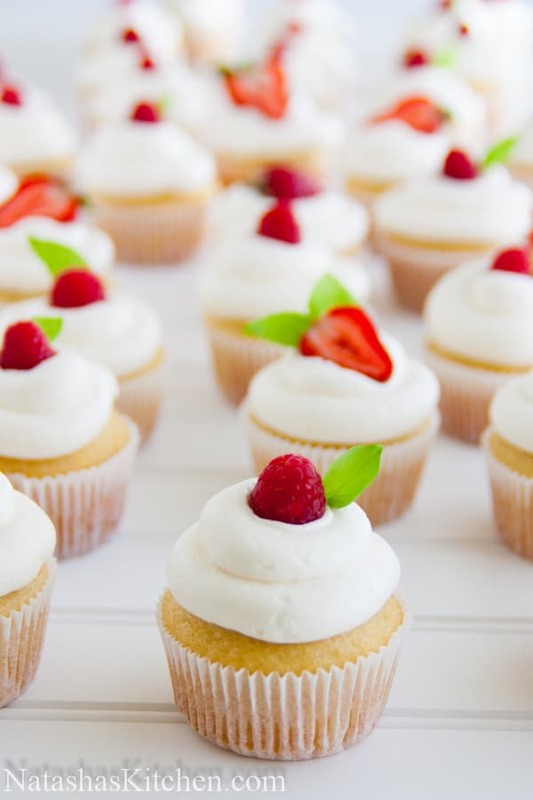 This is the only vanilla cupcake recipe you need! They are perfectly soft, rise evenly and go well with just about any cupcake frosting. The best cupcakes! 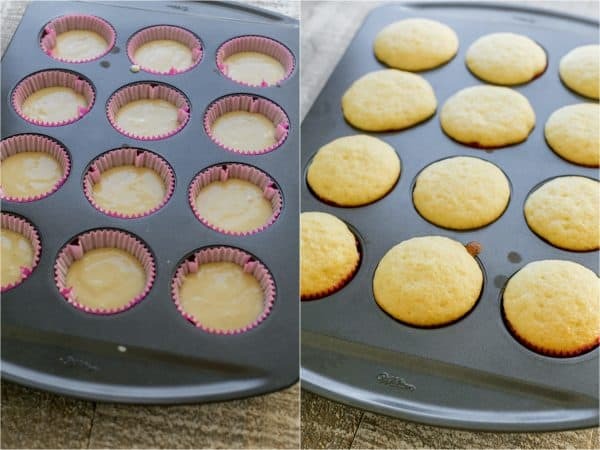 Preheat the oven to 350°F and line a cupcake/muffin pan with cupcake liners. Bake for 12 -14 minutes at 350 °F or until a toothpick inserted in the center comes out clean. Let them cool in the pan for a couple minutes, then remove. Once the cupcakes are cooled to room temp, pipe on the frosting. 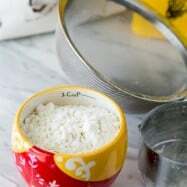 A note about the flour: all-purpose works, it just doesn't produce a cupcake quite as soft as cake flour or Canadian Flour. P.S. Thank you all for trying this recipe and making it so popular! We’ve had to turn the comments off on this one after reading 1,231 of your amazing comments and reviews. Thank you all for trying this recipe and sharing it with the people you love ❤. Hi Natasha, I would like to makes these but my baking powder already has baking soda and salt. Should I still add it? and if not how much of just the baking powder that has all 3 ingredients? I did a little experiment with 1 of the cupcakes. I put the batter of a single cupcake away in the freezer for a few days. I then thawed the batter and baked it in the airfryer. Came out beautiful Was just like the original batch. For the vanilla cupcakes. Must I use granulated sugar or castor sugar? Good morning! I hope this reaches you in time for my son’s birthday tomorrow 🙂 I will be trying this recipe as it great such great reviews! However, I’ll have a few substitutions as I already went shopping for (a failed recipe’s) ingredients lol. Can I substitute heavy cream with anything? Yogurt and milk mixture perhaps? Also, I am specifically making ice cream cone cupcakes. So instead literally putting the batter in an ice cream cone for baking. Since these cupcakes rise a god amount, approximately how much should I put in each standard cake cone? I want to make 60 cupcakes with that recipe! Do you suggest to multiply the ingredients by four, or to do the recipe 4 times? Hi Julie! I haven’t tried that but one of my readers recommended to do it in separate batches. For what ever reason it did not work for them to double it (four times in your case. 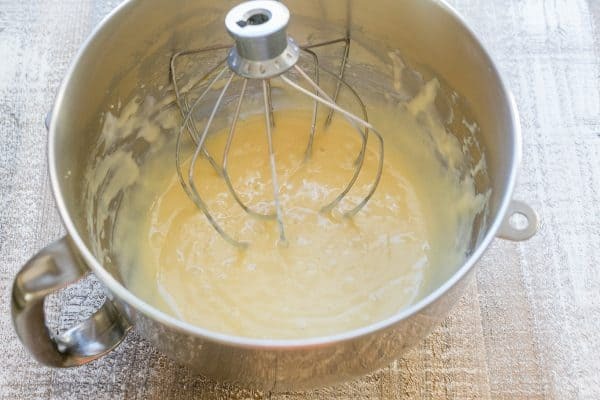 It may be because if you leave the batter on the counter while the first batch is baking, it may effect how effective the baking soda and baking powder are in the recipe. I have always personally made separate batches. 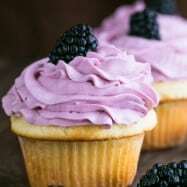 Thank you so much dear for your quick reply.The cupcakes cakes came out absolutely perfect and now this recipe will stay with me forever as my go to cupcakes!! You are an awesome cook Natasha. That’s so great! Thank you for the update! I’m so happy you enjoyed that! Hello, can you substitute the oil for unsalted butter?? If so how much? I make these.all the time. Always a hit. I pair the vanilla cupcake with a dulce de leche cream cheese icing. Or sometimes I take out 2 tbsp of flour and replace it with 2 tbsp pumpkin spice and top it with cinnamon cream cheese icing! Yum! I would love to make these for a bridal shower. Do you think I should make them and freeze or make the batter and freeze it? I’m from Australia and haven’t heard of Canadian flour. I had just made those cupcakes and they were delicious and fluffy! Hi I made these cupcakes today and It taste great. One issue is the cupcakes are rising in the oven but deflated and ugly once cooled. I have made this as cupcakes/layered cakes countless times and always turned out wonderful. Just made a little tweak. I did used cake flour. I used just 1/2 cup sugar. I realized that I don’t have buttermilk so as Asian as me, I used coconut milk. I used olive oil instead of canola oil. Hi. these look great and I hope to try them for my son’s birthday. 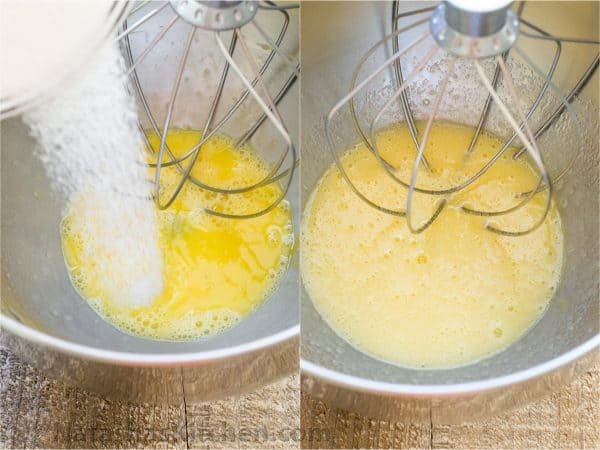 I wanted to ask if you can use a food processor instead of a mixer to combine the ingredients? Will the regular knife attachment work? The best cupcakes ever! I’ve finally found a trusted recipe that’s flop free. I used all purpose unbleached flour and measured carefully. But I live in Calgary so perhaps it’s the high elevation that is the culprit! Love your blog, the photos are super helpful! I had to fight my friends away from this cake with a stick! Lol. To turn it into a cake, I prepared two batches of batter in their own bowls instead of doubling the recipe. I poured both bowls of batter in their own 8 inch pan and placed both pans in the oven at the same time for about 28-29 minutes exact. It works very well in 9inch pans also. I do suggest that if any of your readers are using springform pans that they line the pan bottom with parchment or wax paper (the batter is thin!) BEFORE they seal the springform around it. Make sure the ends of the paper are sticking out so that when you “release” the bottom you can easily lift the cake from the base once COMPLETELY cooled using those paper ends. I’ve been wanting to try this recipe for awhile, but I was planning to use silicon cupcake liners. Do you think it will change the bake time or temperature at all? This really is the perfect vanilla cupcake. I’ve been testing recipes for five or six years and none were even close to the flavor and texture of this one. As a bonus it also has a lovely crown. I was careful not to over mix, in fact I stirred in the flour and buttermilk by hand and then ran the mixer only to smooth the batter. I also added 1/4 teaspoon of Wilton’s butter flavoring. I baked an extra minute to achieve slight browning. 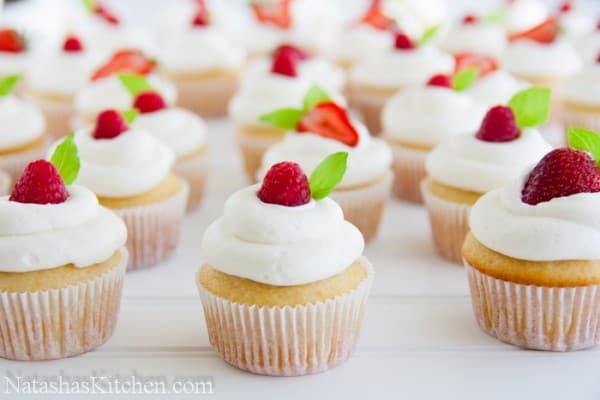 With picky eaters at home whether it come to desserts or anything,I gave this cupcakes a try. I’ve never posted a comment on recipe blogs before, but these cupcakes are so good I had to add my 2 cents. I baked them for a baby shower on the weekend – used vanilla bean paste instead of vanilla extract, and iced with vanilla bean swiss meringue buttercream. They got RAVE reviews – several said I should be charging for them. Hi, I need to know for how long can I store them in the fridge before frosting and will the cupcakes still taste fresh. 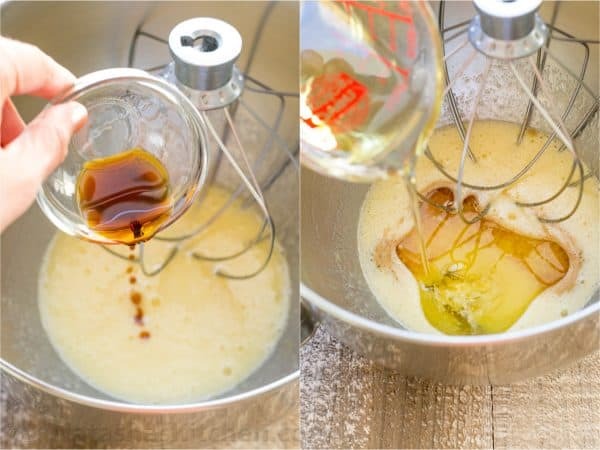 Thank you so much for sharing this recipe….it will definitely be my first choice when baking cupcakes for any occasion. What company of Canadian flour do you use? The link no longer works.